I’ve been renovating my families new home and now that we’re (more or less) settled in, it’s time to start quilling again. And, since my main goal this season is too enjoy the summer, i thought I’d jump right back in with a tutorial on my mini quilling paper citrus slices. They’re so bright and fun, they make me think summer every time I make them. Just like in my quilling strawberry post, I’ve drawn up a basic citrus slice template for you to use in this project! Feel free to enlarge the printable for your needs. As is, they are meant to be on the mini side. They will measure about 1 1/2 inches from side to side. Once you’ve printed your template and pinned it under wax paper to your work board, its time to start rolling some papers! The rest of the supplies are fairly standard for quilling. You will need your needle tool, tweezers, glue, straight pins, white quilling paper, and colored quilling paper for the type of citrus of your choosing. For this tutorial, I’m going to make an orange slice, so I’ve chosen a dark orange for the rind and a paler orange for the segments of the fruit. The first step to quilling these mini citrus slices is to make the outer rind. Each slice needs about 20 or so tight coils, rolled from 1 inch strips of the dark orange paper. Starting from one end of the fruit slice, glue the coils side by side around the outside of the template. I find that it’s really efficient to dip the side of each coil into a teeny amount to glue instead of picking up and squeezing my glue bottle for every coil. Be sure to use as little glue as possible or wipe away to excess after all the coils are placed where you’d like them. Use a few pins to keep the coils in place as the glue dries. One pin every 3 or 4 coils will do fine. As the outer edge of the fruit slice sets, its time to make the white pith that separates the segments of the orange. Simply fold a long strip of white quilling paper in the center. Next, using a very thin, but steady line, place glue along the entire length of one half of the strip. Press both halves together carefully, and when it dries, the strip will be a bit sturdier and thicker and perfect for adding to the citrus slices. Apply a thin line of glue along the inside of the orange rind. Place the white strip along the curve and cut the excess. Hold still for a moment until the glue sets, or pin if you’d like. Next up is the citrus segments. Each slice has 3 segments, which are rolled from 7″ strips of pale orange paper. For each segment, I rolled a strip into a loose scroll, but before I removed my needle tool, I pulled on the end of the coil to open it up even more. The end result is a more open scroll, with a tight center. To make each segment, apply a small amount of glue to 1/3 of the white strip curve. Using your fingers and pins, spread one of the scrolls out so it fits nicely in the triangle space of the segment. If you find that your segment seems a bit crowded, tear off a bit of the scroll and try again. Once you’re happy with your segment, move on the glue the next one. The last step to each citrus slice is to add more white strips to separate the segments. Using the same double thick white paper, apply a small amount of glue to both sides of one end. Place the strip between 2 of the segments and trim the extra. Repeat to separate the other segment. I love the mix of colors of oranges, lemons, and limes, but let your imagination go! Quill up some pink grapefruits or blood oranges too! 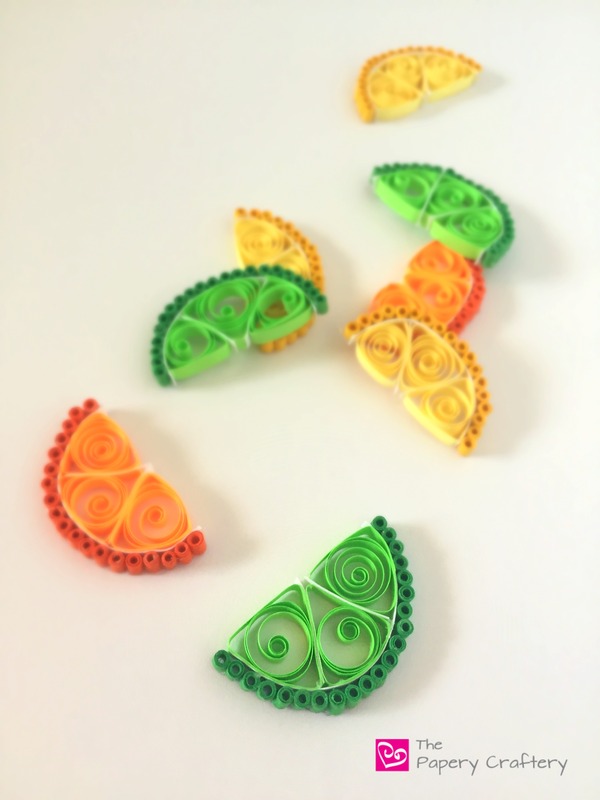 Let me know how you’re using your quilling paper citrus slices! Leave a comment below and tell us all about it! You’re welcome! I’m glad it is helpful to you.